Technologies have been driving consumers' needs and investors' profits. Consumers and investors are benefited by reliable forecasts of implications of different technological options. Cdma, Evdo, Gsm, Lte, and Wireless are different technological options available for mobile phone services. 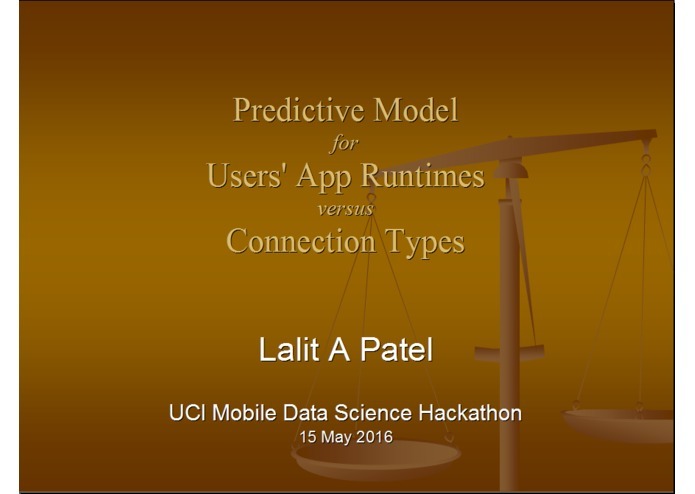 It provides a predictive model to predict users' app runtimes versus connection types, in the form of an iPython notebook file. It is possible to extend this in the form of an interactive webpage or a python class for reuse. It is also possible to extend this work to a predictive model to predict battery drain rates versus applications usage. I was initially planning to develop a predictive model to predict battery drain rates versus applications usage. However, due to huge sizes of datasets and limited times, I could not undertake that project. For this particular project, I could not import csv files of all days, due to limited computer resources. Therefore, I have trained the mode with csv files of a single day. After spending some time, I could understand the inter relationship of all csv files. I could formulate reliable methods for developing predictive models for different purposes. There is a clear need for a formal method of analyzing separate datasets of small time periods and then compiling separate conclusions into general conclusions. I would like to develop a predictive model to predict predict battery drain rates versus applications usage.